Iowa is a prominent whitetail hunting state, with non-resident tags not particularly easy to obtain. It is highly unlikely to get drawn the first year you apply but you'll net a preference point for the usual applications fees. The second year, your odds are far better with the third year close to a certainty. We had one preference point, we were drawn for the first firearms season that opens December 1st, so the morning before we set sail for Appanoose County, Iowa. The weather was unseasonably warm, setting an all-time record a couple of days into the season. 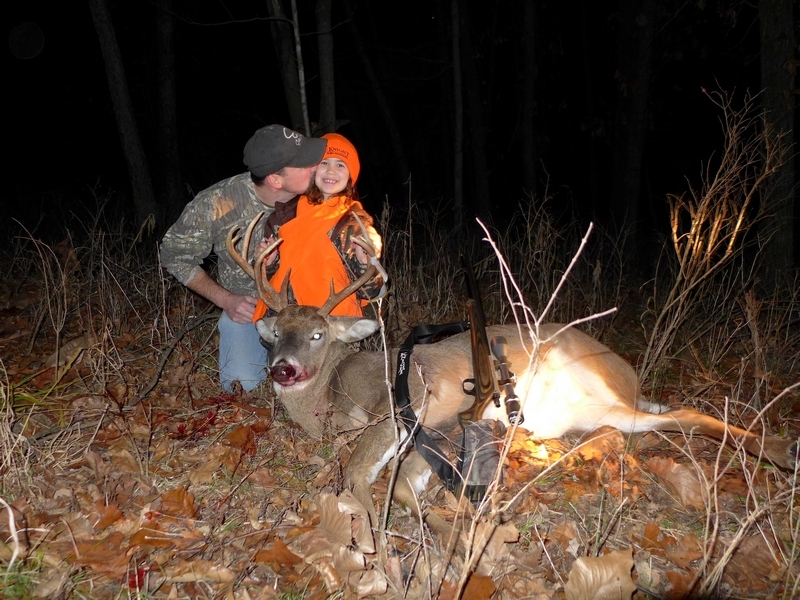 Grace Knight is the eight year old granddaughter of Rose and Tony Knight, the daughter of Bill Knight and this was her first deer hunting season. Grace had been practicing with Grandma's MK-85, a shortened stock mini-MK-85 Tony had made years ago in .45 caliber. Grace gained enough proficiency with her range work under the watchful eye of Dad to put the bullet just where it belonged out to one hundred yards, so this year she got to hunt. It didn't take long for the action to start opening morning. Right at first light, a procession of four animals appeared walking single file, at a deliberate but unhurried pace, right in front of my blind along the timber. It was doe, doe, buck, buck. The bucks were both shooters, but I had been hunting for all of about four minutes. I decided to let them go, I sure wanted more time in the hunting woods than that, but that seemed to be a mistake as time went on. The rest of the morning was relatively uneventful, several does moved through the area, with one monster buck apparently jumped that charged past my blind at mid-morning. I heard his hooves pounding the ground before I saw him, he was only 35 yards away, but even though the muzzle went out of the blind quickly, I just as quickly ran out of blind. There was just no room to get a good swing through on him. That evening, though, Grace had debated but eventually passed up on a forkhorn. That was the right call, for it wasn't that much later than she had a pair of eight point bucks to choose from. 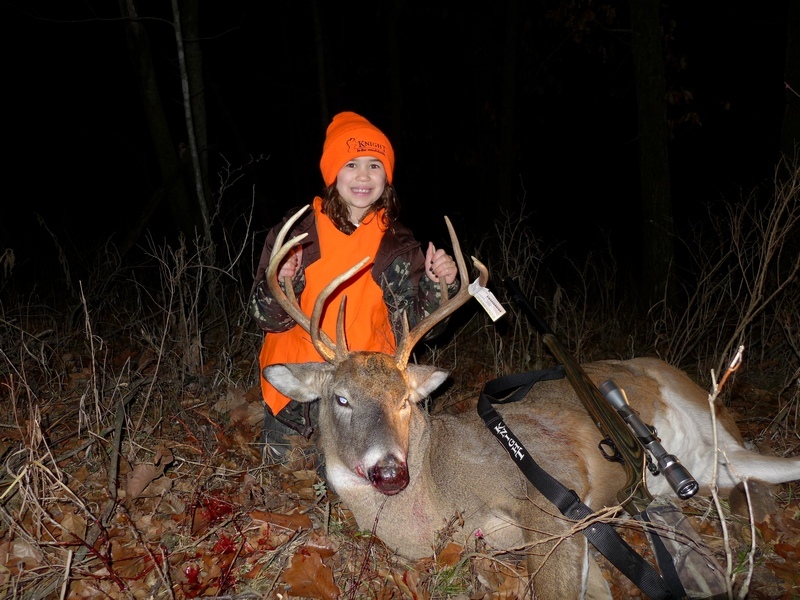 Grace connected with a beautifully placed shot, and the result was a nine-point buck: a huge animal for an eight year old girl. That's a moment that Grace and her Dad will never forget. Grace made the superb shot at 80 yards, pushing a 40 caliber 165 grain Barnes All-Copper bullet in a tan MMP .40 / .45 sabot with 70 grains by volume of Triple Se7en loose powder. This was through the MK-85 her grandfather designed; now all three of Bill Knight's kids have taken their first deer with this very same muzzleloader. The next day, the fog rolled in and it didn't go away. Very poor visibility, not just for us, but for the deer as well which are reticent to move when they can't see very well. 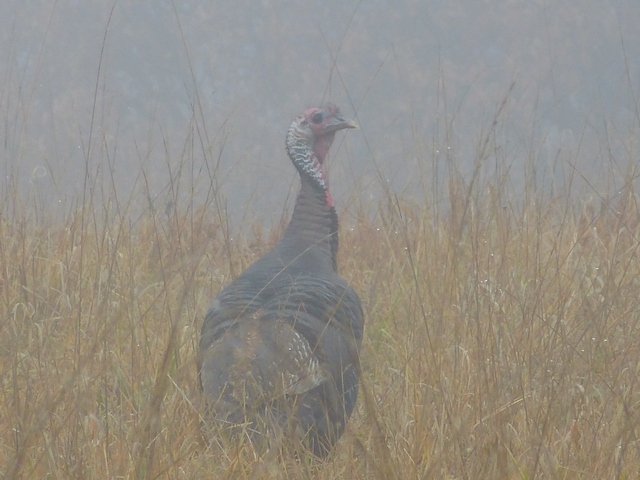 We hunted of course, above are turkeys in the fog, but there wasn't much deer action. By the evening of the third day, the fog had finally lifted, but it was quite windy with some impressive gusts. When you are in a blind and does nuzzle up to within four or five yards, you know you are in a good blind and you're not excessively odoriferous. The pair of does above stuck around for close to half an hour before finally drifting into the woods. 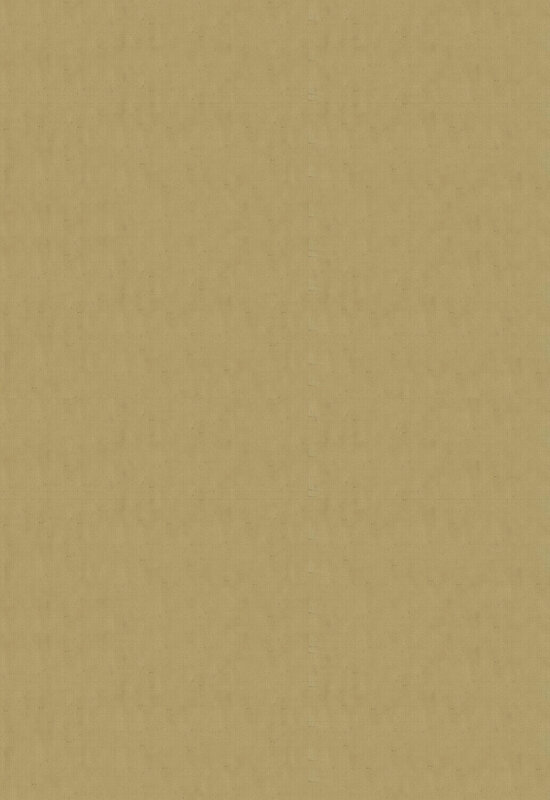 Finally, on the evening of the fourth day, things picked up. I wasn't in my blind in the afternoon for more than a few minutes when I spotted a large buck moving through the woods but about 360 yards out. As the sun went down, a steady stream of does filled the clover and turnip fields. All told, there were fifteen or so does. The second buck turned out to be a spike, out at 130 yards or so. A little 4 point came within thirty yards or so, fun to watch, but not what I was looking for. Another large deer appeared out in the field to my left, with his head down behind a bush. 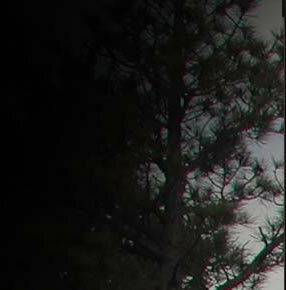 At first, I couldn't tell what he was through the binoculars, just a big deer. He finally picked his head up and moved out farther into the field. He was an 8 point, broadside, out at 157 yards by laser rangefinder. He had no idea I was there, just continuing to walk and browse deeper out into the field. As I was set up with 80 grains by weight of Blackhorn 209 and a 300 grain Parker Ballistic Extreme dressed in a short black MMP sabot, he was easily within range. I had already practiced with this combination incrementally to 220 yards. So, that was about it. Running out of daylight, it was time to get her done. I waited for the buck to stop, the Parker Ballistic Extreme blew threw him like butter, expanding and leaving an impressive exit wound. The buck went only 6-7 yards and dropped dead. A very quick, smooth kill and easy game recovery. It was really no surprise, as this 300 grain Parker has already taken Yukon moose at far greater ranges. 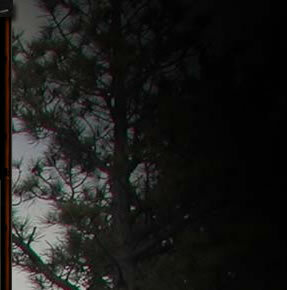 Assuming good shot placement, a whitetail has zero chance, which is precisely the idea. The buck was actually a 9 point, with a couple of broken tines that were old fractures: he was one long, heavy deer. All in all, it was another good day's Knight, and a freezer full of prime venison. We will try for that Big Booner next time; they are certainly out there, with little question. Our deepest thanks go to Rose Knight, Tony Knight, and Bill Knight for all of the warm hospitality! Above, Grace gets a congratulatory smooch from Dad after her epic 80 yard one-shot quick drop. Adult males reach an average weight of around 240 to 265 pounds at about four and one- half years of age while adult females average 140 to 160 pounds. The largest deer ever reported in Iowa was a 440-pound buck taken in Monona County during the 1962-hunting season. Antlers are normally found only on males and a new set is grown each year. Antler growth begins in March or April and continues until August or September when the soft covering of skin called "velvet" dries up and is rubbed off on small trees and shrubs. Antlers are utilized in sparring matches with other bucks to establish dominance for breeding. Bucks shed their antlers in January and February following the breeding season. The animal's age, genetic background, and quality and quantity of food determine antler size. At about six months of age, males will have small-unbranched antlers called "buttons" that are barely visible above the skin. When a buck reaches one and one-half years of age, it will normally have branched antlers with two to five points on each side. As the buck grows older, the size of the rack increases. Peak growth is usually reached at about five and one-half to six and one-half years of age after which antlers may become smaller. The age of a buck cannot be accurately determined by counting the number of points on the rack since this is highly variable, but overall mass of the rack does give an indication of age. Sometimes abnormal points occur which are usually caused by injury to the rack during the growing season, improper hormone balances or heredity. 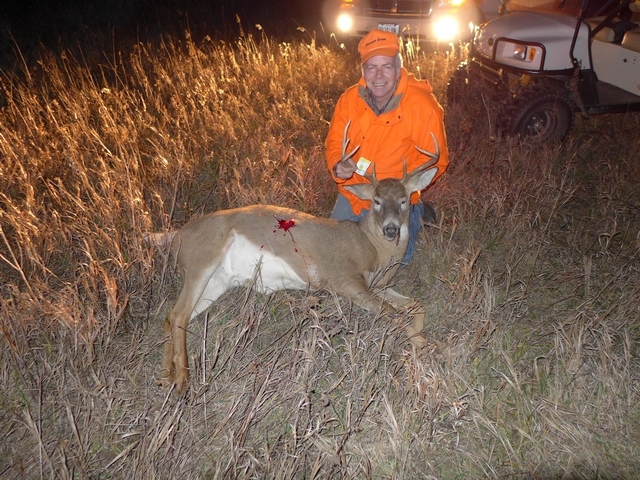 A trophy buck in Iowa is determined by measuring the length of the main beams and the spread between the main beams. The largest typical rack measured in Iowa scored 200-5/8 Boone and Crockett Club points, and the largest nontypical rack was scored at 307 5/8 points (1st in the world). Deer occur in every county, but the highest deer densities are found in the southwestern and northeastern parts of Iowa. Deer are basically associated with timber, and therefore, areas with large amounts of timber usually have the highest deer density. Because timber habitat is limited in Iowa, deer densities are low compared to surrounding states. Good deer habitat in Iowa supports around three deer per square mile of land while poorer habitat supports less than one deer per square mile. With excellent habitat, a good food source and protection from hunting, deer densities can reach as high as 100 deer per square mile. These high densities are usually only found in a small area such as a state park or refuge. The annual home range of deer varies from one-half to one square mile and is determined mainly by availability of suitable habitat, food and water. Home range in the spring and summer is small because of fawn rearing and plentiful food supplies. However, home range increases in the fall and winter because of breeding activity and scarcity of food. Spring dispersal is extensive, with some deer establishing new home ranges as far as 50 miles from where they were born. 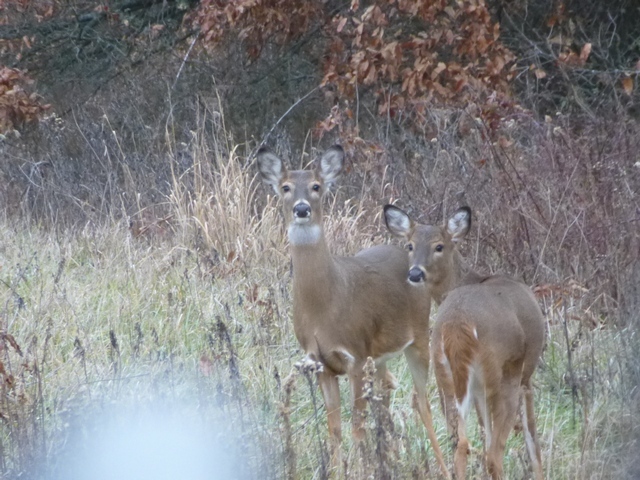 One benefit of this dispersal is that small isolated habitats can be replenished if heavy hunting pressure or some other major mortality reduces deer numbers.